mammals need to obtain more calories per unit time to produce heat (via muscles) by continuously eating foods that are quickly digested and absorbed. This is quite the opposite of larger mammals. As mammals get larger, their surface area-to-mass ratio decreases as the mass increases. Elephants have a heat load problem, not a heat conservation problem. Besides being a small mammal, bats also have additional surface area from their wing membranes. Therefore, this flight adaptation results in about six times greater surface area than that present in non-volant mammals of comparable size, which increases the heat loss rate many fold. Bats solve these extreme heat loss problems through het-erothermy, a temporary reduction in body temperature to conserve calories. 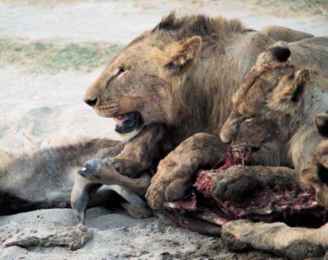 Mammals are endothermic ("warm-blooded"), i.e., they generate internal heat. Most mammals are also homeothermic, which means that they regulate their body temperature within a particular range (generally, 95-102 °F [35-39°C]). Bats, however, can reduce their body temperature to conserve energy. This strategy is called heterothermy and results in torpor. Bats can lower their body temperature to the environmental (or ambient) temperature and therefore do not have to devote calories to produce heat, much of which would be lost to the environment. 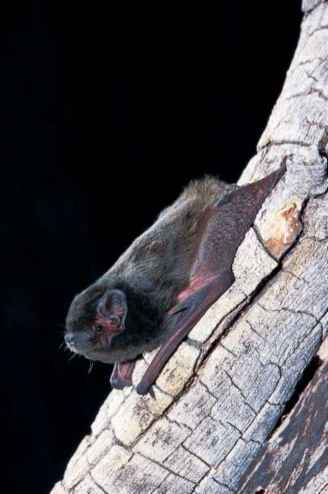 Additionally, bats are able to reduce blood flow to the extremities and to the wing membrane that reduces heat loss through these surface areas. During flight, the bat's thermoregulatory problems are reversed. The problem becomes how to dissipate the heat generated from the flight muscles. Bat wings have a rich supply of blood vessels. Heat is transferred from the blood to the wing membrane and is radiated off the surface. Bats do not have sweat glands, but a small amount of water vapor passes through the skin onto the membrane surface. As water evaporates off the surface of the wing, it also carries away some heat. Another area where the echolocating bats lose heat is from the blood vessels of the large external ear. Breathing also helps remove heat. Water vapor is one of the byproducts of respiration and, when the animal exhales, more heat is dissipated. Some species can build up a heat load while they are resting during the day. This is more likely to occur among the larger bats, but some smaller bats that roost in sunny locations face this problem as well. In these situations, temperature can be regulated through behavior by moving to a shadier location. Some bats will also use their wings to fan themselves. Sometimes, they also lick themselves to promote evaporative cooling from the saliva.